In possessing a relatively thick, coiled shell with a moderately high spire the Acteonidae is one of the families least evolved towards the bubble shell condition The shells of acteonids have, a narrow, elongate aperture and are spirally sculptured with punctate groves. 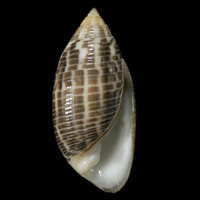 The animal can completely withdraw into the shell and has an operculum, in contrast to the next family, Aplustridae. Acteonidae is a large family, divided into 19 Recent genera, with the genus Acteon alone containing 77 species. Species occur worldwide in tropical and temperate waters; in Australia 19 species are recognised. The widespread tropical Indo-West Pacific acteonid species occur in northern Australia, with one of them, Pupa affinis, reaching as far south as Sydney. The other three species documented here from NSW have distributions restricted to eastern Australia. Acteonids are infaunal animals, living in the shallow subtidal and below, down to at least 3000 m. In southern NSW estuaries they live in sandy areas just below the low tide level, and their shells are commonly washed up on beaches. They burrow through the top few centimetres of the substrate, searching for the sand-dwelling polychaete worms upon which they feed. Indo-West Pacific species are treated well in Marine Molluscs in Japan (Okutani, 2000). Acteon dolichoroseus Iredale, 1936 was described from material taken by the dredge Triton from Sydney Harbour. It is known only from the holotype. Many of the shells taken by the Triton are fossils, sometimes of tropical species no longer found in NSW. Further specimens of this have not been recognised from NSW, so it is probably a fossil dredged from below the bottom of the Harbour. Pupa nitidula Lamarck, 1816 was listed as occurring in NSW by Iredale & McMichael (1962, no. 1818). This is a widespread tropical species, and is not known living south of One Tree Island, southern Great Barrier Reef (R.C. Willan pers. comm.). There are no specimens in the Australian Museum collection originating from south of central Queensland. Therefore, if not erroneous, the NSW record may be based on a fossil specimen dredged from Sydney Harbour. Pupa roseomaculata Iredale, 1936 was listed as occurring in NSW by Iredale & McMichael (1962, no. 1820). This is now considered a synonym of Pupa solidula (Linnaeus, 1758). Pupa solidula itself is a widespread tropical species, and is reasonably common throughout Queensland. The southernmost record is from Tugun, southern Queensland (R.C. Willan pers. comm), but it is highly possible it will also be recorded from northern NSW in the future. As with Acteon dolichoreoseus, the NSW record may be based only on a fossil specimen dredged from Sydney Harbour. Shells are solid, with a moderately tall spire and long aperture, are spirally sculptured, and have strong plaits of the columella. The shells of acteonids are notoriously difficult to identify because they are mostly uniformly coloured and have similar shape and sculpture.